Flexible endoscopes present a unique challenge for hospitals to track and manage – these expensive medical instruments must be quickly re-processed after usage in order to provide the required instrumentation for the next procedure, yet they must undergo rigorous, time-consuming reprocessing after every use to ensure the highest levels of patient safety. Due to different clinicians having opposing priorities, hospitals and surgery centers often have leaky and inconsistent processes around endoscope management. Many sites have no accountability for their endoscopes at all, not even a basic “sign-in/sign-out” log book. Others have a manual or even nonexistent system for documenting the steps of the reprocessing cycle in between uses. These poor documentation practices lead to headaches for managers who are in charge of making sure that the required scopes are available and disinfected at all times. With multiple visits to your hospital occurring annually by surveyors from The Joint Commission and other hospital accreditation bureaus, GI practice associations, state Departments of Health and others, there is a high chance that your endoscopy department will have an audit of its practices this year. During these audits, survey methodologies like the tracer method will demand that your department presents its scope usage, reprocessing and other similar data to the surveyors in a timely, accurate and reliable manner. The demands from surveyors have become increasingly sophisticated over time. The expectation now is for electronic data to be presented in near real-time. This is a big departure from the days of paper files, when time to respond was measured in hours or days, not minutes. If your department wants to make sure that the next survey goes well, make sure that electronic documentation of all of your endoscope-related activities is available instantaneously for your surveyor. If you’re still searching through log books and accordion-style folders for the required documentation, there is a definite risk of a negative finding from the surveyor. Today, an all-electronic audit trail of all scope activity is a must for a successful endoscopy practice. This will act as a central repository of all scope-related data, and will allow you to present to surveyors a validated set of electronic documentation regarding your operations. This documentation will also become especially useful in the case of a potential infection control issue. Previously, staff had to search through hundreds if not thousands of paper records to find the necessary data for their investigation. This process can now be replaced by a digital search that can be completed in just minutes. The nature of flexible endoscopes makes them a risk to transmit highly infectious diseases if not cared for properly. In fact, the danger that endoscope reprocessing presents was listed as the #2 Health Technology Hazard for 2018 by ECRI Institute, and endoscope safety has appeared on their annual list in 8 of the last 10 years. Improperly reprocessed scope incidents over the past several years have endangered many patients’ lives, damaged the reputations of many hospitals and cost many of those same hospitals millions of dollars in damages. Enabling the electronic documentation of all of your endoscope-related activity can be a boon to patient safety in the endoscopy department. If any steps of the reprocessing cycle are missed, or in a worst-case scenario if the whole reprocessing cycle is missed, the software can alert department administrators about the missed step(s) before the scope is re-used on another patient. This crucial “second pair of eyes” can help watch over the endoscopy department and all of the minute steps along the way to identify threats to patient safety before a human can. Today’s endoscopy department typically has many types of users accessing scopes: physicians, residents, nurses, techs, etc. With so many people handling scopes, it’s often hard to keep track of each instrument and have it ready and available for the next procedure. And with flexible endoscopes costing tens of thousands of dollars per scope, they can often be the target of borrowing by physicians or theft and cause a major headache for administrators. With an all-electronic audit trail of your endoscope fleet, you now have a constant monitor of the whereabouts of each scope. At any time, the last known location and user can be found for any scope. Missing scope alerts are also activated to let managers know when a scope has gone “missing” from the system for a period of time. These alerts include the last known location of the scope and the last known handler, so tracking down the scope becomes a much simpler process. In addition to preventing loss or theft of scopes, these alerts can also reduce the turnaround time for reprocessing scopes by making sure that all scopes are returned for reprocessing within a reasonable amount of time. Due to the persistent lack of data that many endoscopy departments are experiencing, having a reliable source of data to improve operations can seem like an impossibility. With the implementation of an all-electronic audit trail for your scopes, you will now have access to a dependable data set that can be analyzed to constantly improve your department’s operations. With the introduction of data analytics to your endoscopy operations, relying on “gut feel” or physician demands as the drivers of change will be a thing of the past. If the clinical team decides it’s time to procure a new scope, you can simply look at usage data to see if the new scope is truly required, or if they actually have enough for their current workload. You can start to analyze how long the reprocessing cycle is taking and see what are the key steps along the way that are creating bottlenecks. You can also start to examine which scopes are being sent for repair most often, or which automated endoscope reprocessors are being used most often, among other analyses. An additional efficiency that your endoscopy department will benefit greatly from is the ability to automate the tracking of endoscope hang-time limits. These shelf-life limits are often set at 5, 7 or 15 days, and require a daily visual check of each scope to see which scopes need to be sent for reprocessing before they are used in another procedure. Having an all-electronic audit trail for your scopes means that you now have a fully automated system for understanding which scopes need to be reprocessed each day due to the shelf-life limit being reached, and an automated alert can be sent that shows the exact scopes and their locations to simplify the very manual process in place today. 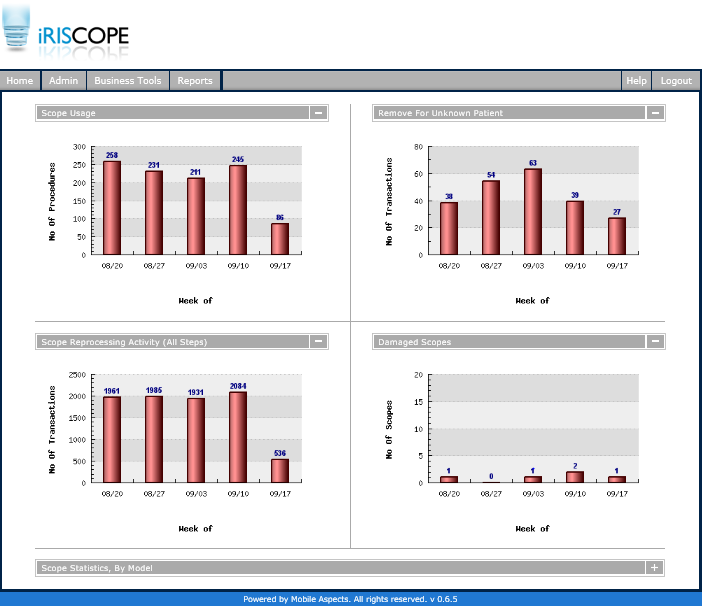 Systems such as iRIScope from Mobile Aspects have been introduced in the last several years to automate the documentation of the entire endoscope usage lifecycle. These systems automatically record all of the usage and reprocessing activity associated with each flexible endoscope to create an all-electronic audit trail. As discussed above, this audit trail provides numerous benefits to your endoscopy practice in the areas of regulatory compliance, patient safety and operational efficiency. No more log books, no more printed tickets from your endoscope reprocessor and no more paper tags – just electronic documentation that makes your department more effective and more efficient. When Joint Commission comes knocking, blow them away with your ability to trace all of your endoscope-related transactions instantaneously in an electronic format. When a physician asks for that new scope, verify with data how necessary that new scope really is. And when steps in the reprocessing cycle are missed, make sure patient safety stays priority #1 by having the system alert administrators about possible cross-contamination issues.